Could Drinking Too Much Juice Increase Your Gum Disease? Drinking a glass of orange juice is a common practice at breakfast. And, recently, drinking freshly squeezed juices (a mixture of fruits and vegetables) has become a trend, being touted as the healthy thing to do. But, could drinking too much juice increase your gum disease? Gum disease is a bacterial infection of your gums. 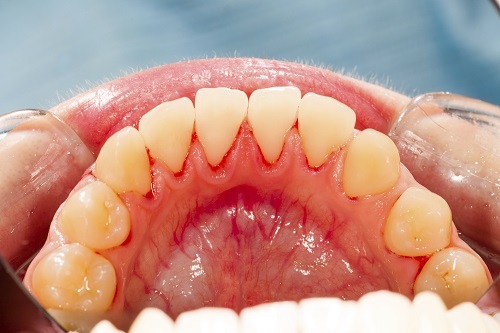 It starts as gingivitis, which is usually indicated by red, swollen, bleeding gums. As it progresses, bacteria fall below the gum line and infect your teeth and jawbone. Severe gum disease can lead to tooth loss as well as other health issues as bacteria get into your blood stream. Juice is simply the liquid squeezed from fresh fruits and vegetables. It is strained, and therefore lacks the fiber that the produce naturally contains in its original form. Fruits and vegetables contain many essential vitamins and minerals that your body needs. However, when you extract the liquid from the produce, you need to use a lot in order to get a single glass. Fruits, in particular, contain a lot of natural sugar, and by utilizing several whole fruits to get a single glass of juice, you wind up with a lot of sugar. When you drink your juice, the sugars tend to get stuck in your mouth, between your teeth and embedded in the plaque on your teeth. Sugar is a favorite fruit for the bacteria in your mouth. If you don't drink a glass of water or brush your teeth following your juice, you give the bacteria time to start eating. The bacteria produce harmful acids that attack your teeth and gums, and they begin reproducing. While you may enjoy your glass of juice, there is a better way to get the same benefits without facing a significant risk of gum disease. Rather than drinking juice, start eating whole fruits instead. You get the same refreshing taste without all of the sugar. If you still want to drink your juice, taking extra precautions with your teeth is important. Brushing your teeth at least twice a day and flossing daily is essential to preventing gum disease, but if you drink juice, you should add extra brushing sessions. If you cannot brush, follow your juice with a glass of water. And if you notice any signs of gum disease, don't hesitate to contact our office to schedule an appointment.